2009 HUMMER H3 SUV LUXURY 4WD 3.7L 4X4 84K MILES 1-OWNER LOW MILES WELL KEPT LEATHER SUNROOF BRUSH GUARD 20 WHEELS ALL TERRAIN TIRES LOOKS AND RUNS GREAT 100% AUTOCHECK GUARANTEED WE FINANCE WAC. Call us now for more details 800-651-1718 At Loan Star Motors we offer the lowest rates and loan terms for your best deal. We have teamed up with many financial institutions to provide you with the best financing options possible. At Loan Star Motors we AutoCheck every vehicle before purchase and do a DMV background check. Welcome to the Loan Star Motors Family. Thanks for shopping our inventory and we look forward to assisting you in your next purchase. WWW.LOANSTARMOTORS.COM We stand behind our product with a low cost 30 day warranty on all Domestic and Import model vehicles. At Loan Star Motors, we offer financing as low as 1.99%. NO CREDIT - BAD CREDIT REPO - BANKRUPTCY - E-Z SPECIAL FINANCING OPTIONS. Family environment, Upfront & honest! Call Now & See How Easy It Is! College Graduate Program! Great Discounts for Military, Police, and Fireman! 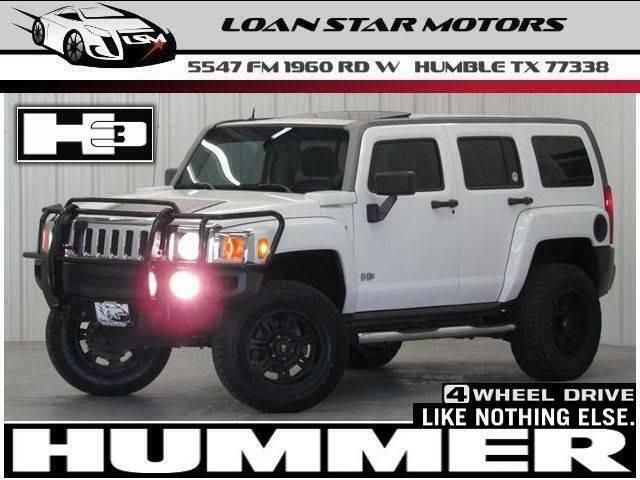 PHONE: 800-651-1718 The HUMMER H3 is the benchmark all other SUVs strive to meet. With exceptional power, towing and handling, this SUV can handle anything thrown at it. With 4WD, you can take this 2009 HUMMER H3 to places roads don't go. It's all about the adventure and getting the most enjoyment out of your new ride. This vehicle has extremely low mileage on the odometer, so while it's pre-owned, it's practically new. Marked by excellent quality and features with unmistakable refined leather interior that added value and class to the HUMMER H3 More information about the 2009 HUMMER H3: The 2009 Hummer H3 may be smaller than the H2, but it is no less imposing wherever it shows its massive chrome grille. Physically, it is only 6-inches shorter, 3-inches shorter, and 2,600 pounds lighter. The H3 is priced at $29,630 less than the H2, making it a real value in Hummer-per-dollar. The 2009 Hummer H3 continues its focus on off-road by providing capibilities and features geared toward the off-road enthusiast. This model sets itself apart with off-road capability. and Excellent off-road performance WE OFFER NATIONWIDE FINANCING OPTIONS, COMPETITIVE RATES, DISCOUNTED SHIPPING AND WELCOME TRADES. Extended warranty programs and low APR financing available (With Approved Credit). Toll Free 1-800-651-1718 Visit us on the web at http://www.loanstarmotors.com All advertised prices exclude government fees and taxes, any finance charges, any dealer document preparation charge, and any emission testing charge. The price for listed vehicles as equipped does not include charges such as: License, Title, Registration Fees, State or Local Taxes, Dealer Prep, Smog Fees, Credit Investigation, Optional Credit Insurance, Physical Damage of Liability Insurance, or Delivery Fees. DEALER makes no representations, expressed or implied, to any actual or prospective purchaser or owner of this vehicle as to the existence, ownership, accuracy, description or condition of the listed vehicle's equipment, accessories, price, specials or any warranties. Any and all differences must be addressed prior to the sale of this vehicle. Your actual mileage will vary depending on how you drive and maintain your vehicle. 2009 HUMMER H3 SUV LUXURY 4WD 3.7L 4X4 84K MILES 1-OWNER LOW MILES WELL KEPT LEATHER SUNROOF BRUSH GUARD 20 WHEELS ALL TERRAIN TIRES LOOKS AND RUNS GREAT 100% AUTOCHECK GUARANTEED WE FINANCE WAC.